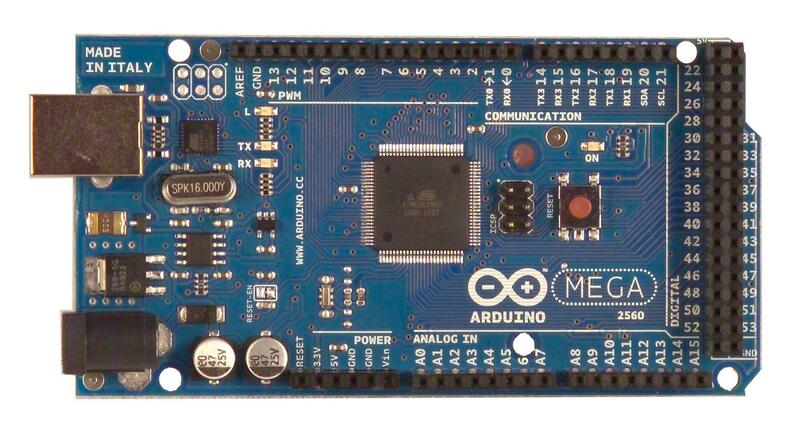 After some soul-searching, I decided to upgrade the project to the Arduino Mega, shown here. It just arrived today. Surprisingly, it’s still very small (4″ x 2.1″), but has eight times more program memory, and eight times more RAM, which I think I’m going to need. It runs at the same clock frequency, 16 MHz. It’s got more I/O than I can ever use. But I’m tempted to try! I built the full-scale chest buss tonight. I still don’t have a solid plan for how I’m going to suspend this thing on my chest yet, but at least it’s operational. Here it is plugged into MiniMe for a test. Nice scope for the money! I’ve got an ancient BK Precision 2120B analog oscilloscope in my studio that I’ve had for years. It works, but it has ground drift when it gets warm, and…well, compared to modern digital scopes, it kinda blows. So I’ve decided to get an Atten ADS1102CAL digital scope to replace it. 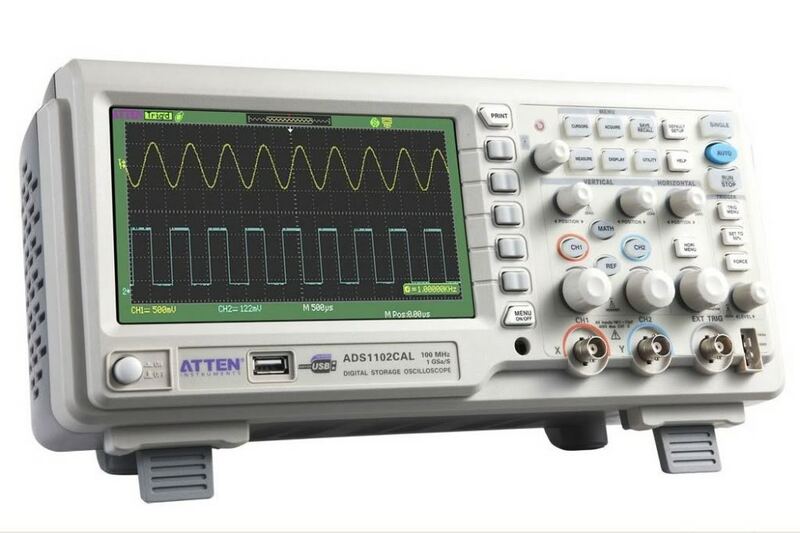 It’s cheap, does FFT, frequency counting, storage, computer communication, etc. Not bad. I got this groovy switch-encoder thing from Digi-Key. 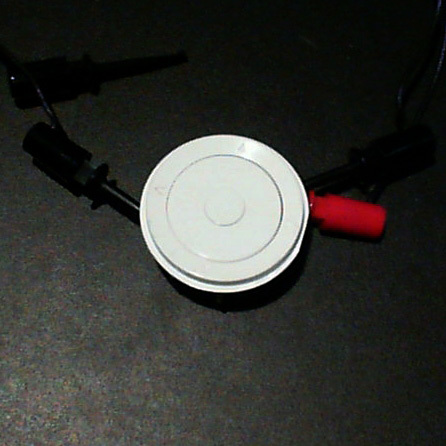 It has four directional switches, a mechanical quadrature encoder wheel, and a center select button. I’ll be using this to control my UI. I have the Arduino reliably listening to this thing using two interrupts sharing the same simple interrupt service routine. I’ve got the full-scale arm and harnesses complete, along with their elastic straps. I’ve become an expert at fabrication with elastic and anorak snaps! 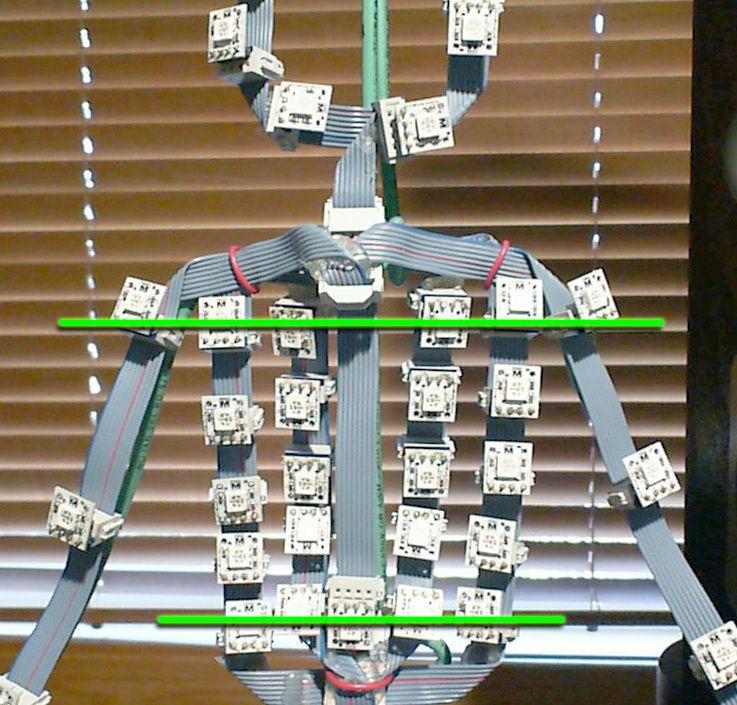 I also made a temporary spine that lets me attach the arms and legs to the Arduino, so I’ll be posting some pics with those harnesses lit up soon. They represent 18 of the 50 total LEDs in the outfit. I made all the straps for the full-size arm harness. Here’s what it looks like all attached. The harness will attach to the spine at my upper chest (not where the wire’s hanging down in the picture). Will build another set of leg straps, and perhaps a test mini-spine so I can try these out running off the Arduino. I built five straps when I built the first full-size leg harness prototype, but I haven’t built any more since – they’re pretty tedious to make, and I have to a lot of hammering to put in the anorak snaps. But there’s not much avoiding it now. 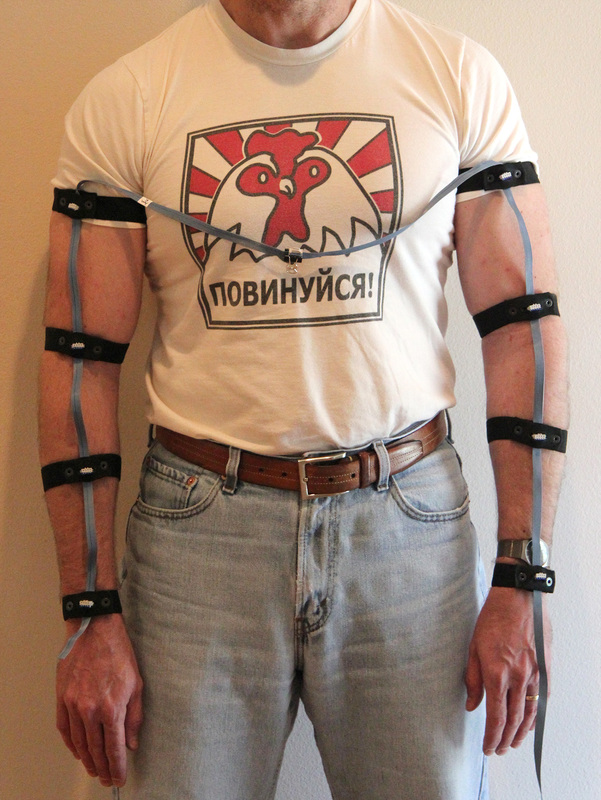 I need to make the complicated chest subharness, and in order to do that I need to make measurements with the arm harness actually mounted on my body.